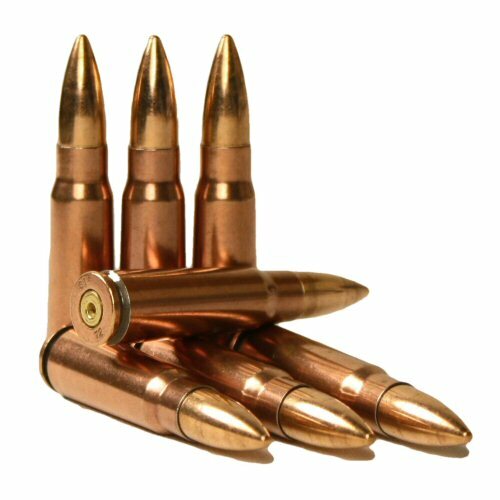 A single inert cartridge comprising of a fired case in 7.62x39mm which has been refitted with a 123gr FMJ head. Heads are correctly fitted with a press and not hammered in place, so the round has a more authentic appearance over rounds where the heads have been inserted too deeply. The steel cases are Russian manufacture with a copper plating that gives the round an all over copper appearance. Primers are all Berdan and fired (indented). Perfect for film, display, diorama or to add authenticity to a AK-47 or SKS. Cases are steel. Please note that all rounds have no propellant or live primers. This is a deactivated 7.62x39mm bullet. Please note that price is for ONE round only. NB: All inert ammunition travelling OUTSIDE mainland UK must be shipped by international courier (eg TNT, DHL).